Born Sylhet, Bangladesh, 1936. University of Glasgow; Chartered Institute of Management Accountants, London (1962); LLD (hon. ), Queen’s University, Canada (1994); EdD (hon. ), University of Manchester (2003). 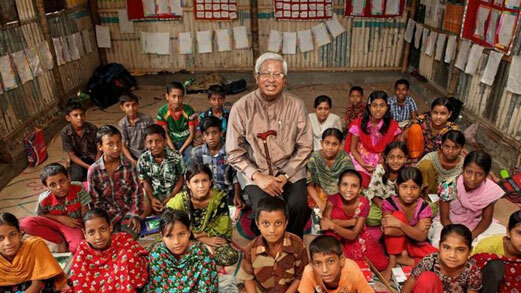 Sir Fazle Hasan Abed, who founded the Bangladesh Rehabilitation Assistance Committee (BRAC) in 1972, describes the strategic and mission-driven underpinnings for the world’s largest NGO. Born in Baniachong, then in British India, Abed studied naval architecture at the University of Glasgow in Britain before qualifying as a management accountant. He acquired British citizenship, but in 1962 returned to (then) East Pakistan to join the oil company Shell, becoming Head of Finance in the local subsidiary. In 1970 he returned to Britain in the face of increasing violence as his country struggled for independence from the rest of Pakistan, and campaigned for European governments to help end the bloodshed. Returning to the newly independent Bangladesh at the end of 1971, he describes in this interview how he found the country devastated, with few functioning schools, health facilities, and agricultural resources. Recognizing the dire need for a strategic intervention, Abed explains how he was able to use his influence and experience as the former Head of Finance at Shell to negotiate for financial support from Oxfam, based in London, and political support from India. Aware of the role of incentives and the power of rigid social structures, he explains how he founded a Research and Evaluation Department to evaluate the underlying causes of poverty, which revealed the need for a multi-dimensional approach to poverty alleviation using microfinancing techniques to address issues around sanitation, agriculture, education, hygiene, and family planning, among others. Now having educated over seven million children, BRAC has become one of the world’s most compelling examples of how a non-profit establishment can exercise a transformative impact when rooted in strong business practices. "Interview with Sir Fazle Hasan Abed, interviewed by Tarun Khanna, April 24, 2014, Creating Emerging Markets Project, Baker Library Historical Collections, Harvard Business School, http://www.hbs.edu/creating-emerging-markets/."